Towards late 19th century, the outlying Belgrano area was the chosen location for the weekend establishments of the local aristocratic families. Here, over the grassy banks, the mansions overflowed with luxury, away from downtown neighbourhoods such as San Telmo and Monserrat. Overtime, throught the building of new houses and opening of new streets, Belgrano became the neighbourhood it is today, while keeping the elegance of former times. 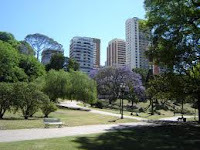 Aside from its lovely banks, Belgrano stands out for its wide commercial offer, gathered mainly along extensive "Cabildo" Avenue and the "La Imprenta" district, just off "Luis María Campos" Avenue. If in search of food, on "Arribeños" and neighbouring streets stretches the small and quaint "Barrio Chino" (chinatown), where the Oriental community has established everything, from supermarkets and crafts shops to numerous restaurants, reasonably priced and serving tasty dishes. The neighbourhood´s landscape is rounded off by the "Inmaculada Concepción" Church (Vuelta de Obligado 2042) and the "Plaza General Manuel Belgrano" (Cuba st. and Juramento Ave.), where handcrafts fair is set up every weekend. - "Barrancas de Belgrano": Holding several sculptures, such as a Statue of Liberty replica and a gazebo. 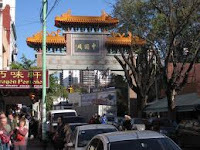 - "Barrio Chino": Tea houses, restaurants, clothing and decoration shops and supermarkets belonging to the Oriental community. - "La Imprenta" district: Added to the small "La Imprenta" commercial district stands the "Solar de la Abadía" shopping mall. - Cabildo Ave.: Stores stand one next to the other. Clothing shops, book and record stores.